Seven years ago, we were wondering what libraries were for in the internet age. This week, the Z.J. 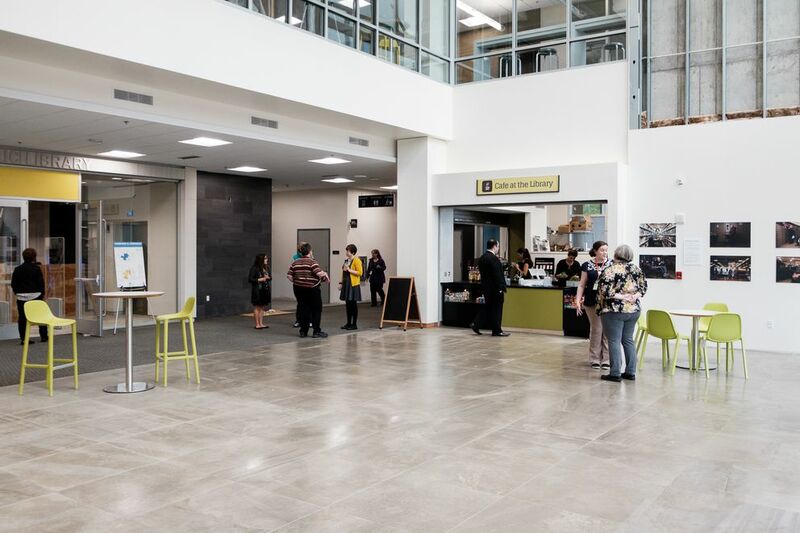 Loussac Library reopened in Midtown Anchorage, answering that question. 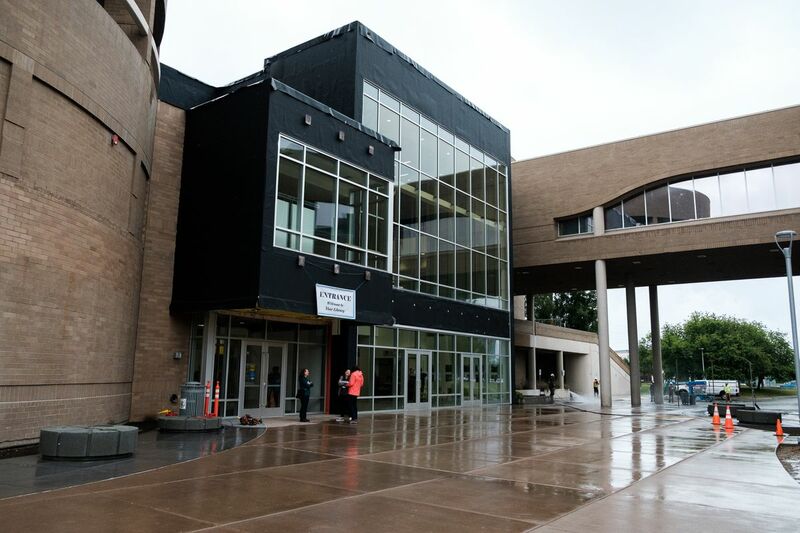 The library remodel won't be finished until the fall, but even with some plywood barriers and unfinished walls remaining, the building responds to one of society's most serious problems. It adds community to our use of information. Previously, the building seemed dark and clogged. The navigational labyrinth was a metaphor for research as we did it back in 1986, when the library was built, and we dug through physical materials for information. 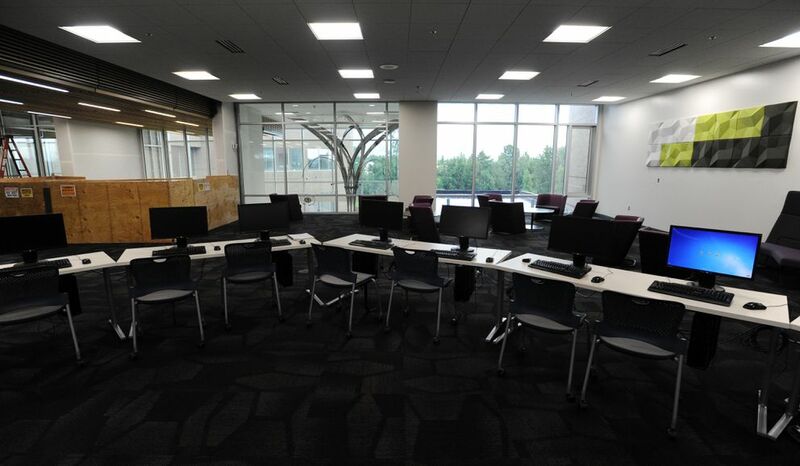 Now the library is bright, transparent and welcoming. Visual connections reach through the spaces. The building's new metaphor is for clarity and permeability. Books are still there, mostly back in the areas where the building remains unchanged, with brown carpet that hasn't been replaced in 30 years. 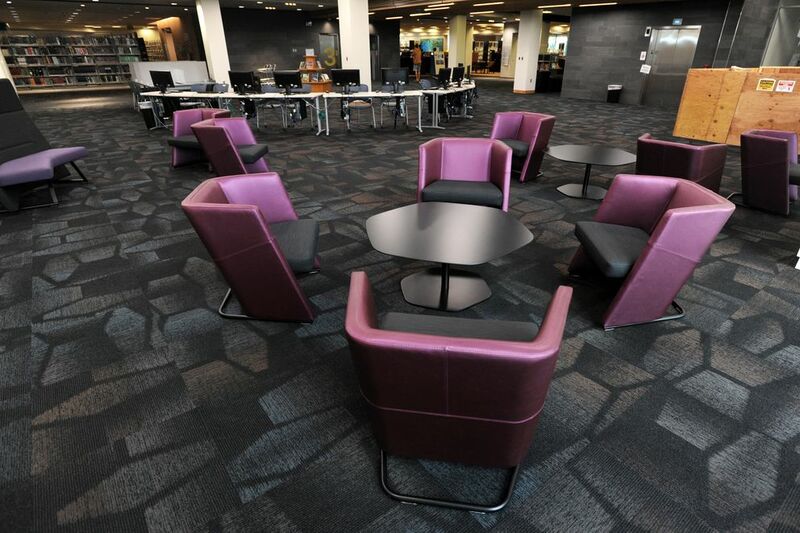 But the main spaces are open and connected, with places to sit and connect electronically or organically. The library has many, many places to meet. You can meet over coffee, gather around a formal conference table or in a large casual group, sit for a Skype interview, talk in a quiet one-on-one space, or settle in at a tech bar and wave at friends passing by. "It kept coming back overwhelmingly that even though the internet has taken over a lot of what a library used to do, it has created other needs," said Clare Ross, who managed that process. "People don't want to sit home alone on the computer. They want to be around other people." The plan, and a facility master plan that followed it, reached out to everyone, from business executives to the homeless people who use the library for shelter. The wisdom that emerged from the process seems prescient now. Now, more than ever, we realize that information is not enough. We need people to help understand what is true and healthy. And we need connection to neighbors to make information meaningful in our lives. The library will do that. It is a building designed to bring us together. "Anchorage is such a diverse city, but we're so segregated in our workplaces and our homes, and the library is the one place for everyone," Ross said. "This is the living room for everyone in Anchorage." Ross left the municipality for two years, running unsuccessfully for the state Senate, but returned a year ago and now is deputy director of the Office of Economic and Community Development. We shared the moving experience of returning to see the library come into shape as an expression of what the community said in those meetings seven years ago. It's rare for an authentic community process be realized in a completed public building. Adversity helped it happen. The master plan called for a $60 million project, but the state appropriated only $15 million, with private donors and the municipality each adding $1 million more. With short funding, the project had to be carefully tuned to public needs (and with more work left). Ironically, a lack of enthusiasm by Mayor Dan Sullivan's administration also helped the project, although it didn't feel like it at the time. Sullivan's team originally preferred to quickly fix the library's failing elevated plaza rather than redo the entire building. Advocates worked long and diligently to gather support for the larger project. That allowed time to clarify the vision, focusing the case for the building. An aligned and talented professional team also made it happen. National library consultant Bill Wilson, who wrote the community plan, gathered and translated the ideas that became guiding concepts for the project. He also warned that we would lose our libraries without investment and change. RIM Architects picked up that broad public effort in the master plan and the design. Over the years the firm kept listening. The design followed. "You could actually say the community designed the building," architect Monica Sullivan said. Alaskans with oversized oil-funded appropriations have sometimes given projects to prestige architects from outside who created inappropriate buildings. RIM, based in Anchorage, worked with a skinny budget to translate community needs rather than showcase architects' egos. Sullivan's skill as a designer is evident in the spare aesthetic beauty of the remodel, but the building isn't her personal statement. She said the team asked the public, "What is the library of the future?" The answer was that the library should be the community's shared portal of information, connecting us together and to the world. That vision made it into even the building's artwork. 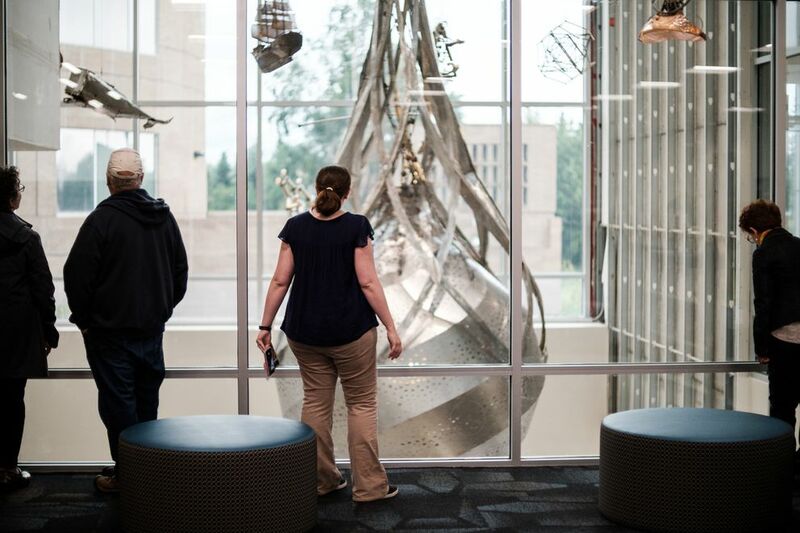 A fanciful hanging sculpture and mobile in the lobby atrium called "Portal of Perception" responds to the idea. The "1% for Art" call for proposals explicitly stated what the community wanted, said Portland, Ore., sculptor Richard Cawley. "Out of 160 applicants, ours was the most portally portal," he said. The library will need more work within a few years. The 30-year-old carpet and boilers need replacement. On the far side of the building from the new entrance, another skylight still leaks. Ross said it is too early to put a price on the issues, but it will be substantial. I hope the success of this remodel will encourage Anchorage taxpayers to support the rest of the work. We've achieved something special here, a major public project completed for a bargain price that will become our primary shared space.